This item was introduced in E-Prime 2.0 (2.0.10.106). E-Prime 2.0 introduced StopAfterMode with options of NextOnsetTime and OffsetTime. The OffsetTime option stops the movie/sound when the object Offset occurs. If the object had a PreRelease value, the stop occurs prior to the duration of the object. The NextOnsetTime option is the new default and more in sync with most experiment author expectations. The NextOnsetTime option stops the movie/sound when the next object sets its onset time. 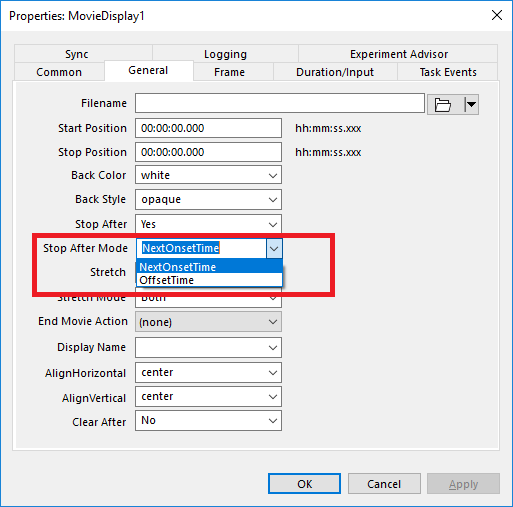 NOTE: The use of the OffsetTime option with any PreRelease value (including the default (same as duration)) may play a brief portion of the movie/sound.